The name Chaldon is derived from Chavedon, or Chalvedon, which has been said to mean "The hill where calves were pastured" or "the retreat or hiding place down". Herring is derived from the Norman family Harang, who became Lords of the Manor after the conquest. The Harang arms include three Herrings. The Domesday book recorded two distinct Manors which correspond to the present Chaldon Herring, or East Chaldon, and West Chaldon, once known as Chaldon Boys, taking its name from the de Bosco family who were tenants. Some of the land was later given to the Abbey of Bindon and Grange Farm was in the possession of the Abbey until the dissolution of the Monasteries in the reign of Henry VIII, when it passed to Sir Thomas Poynings of East Lulworth. The present manor house was built by Richard Gostelowe in 1728; it was purchased by the Weld family in 1790. The parish now covers 3,106 acres and stretches northwards from the cliffs over the downs into the valley where the village lies, then over the ridge with its barrows, known as five Marys, and into the heathland beyond as far as Tadnoll. There was once a medieval cross on the village green, but only the square stone base with central socket remains. Chaldon Herring village has attracted literary and artistic residents. 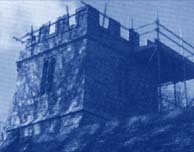 Theodore Powys, who lived for many years in the village, used it under the name "Folly Down" in his novel "Mr Weston's Good Wine". Llewellyn Powys lived and wrote in a cottage on the downs; his memorial stone can be seen on the downs near the masts. Sylvia Townsend Warner lived here, and she and the poet Valentine Ackland are buried in St Nicholas churchyard. The sculptress Elizabeth Muntz also lived here and worked at "The Studio" now known as The Well House. David Garnett set his novel "The Sailor's Return" in the village. Chaldon Boys had a church dedicated to St Nicholas, but its closeness to Chaldon Herring prompted the Bishop of Sarum to unite the two parishes in 1446 as they could be adequately served by one Curate. By 1460 only the chancel of the church at Chaldon Boys remained. There were no burials there after 1466. Some skeletons were uncovered this century when a new corn drying building was erected at West Chaldon farm. The exact origin of St Nicholas at Chaldon Herring is unknown. It possibly originated in Norman times, but the present building is 14th and 15th century with extensive additions and alterations in the l9th century, after which no 12th century work remained. The architect in 1878 was G R Crickmay, and the estimated cost of the work was £1,050. The roofs are part tiled and part stone slated; internally they are of pine. The chancel was rebuilt in 1878 with a wider arch. Two of the three side windows are 14th century, and the east window is an example, rare in Dorset, of a 14th century window having intersecting tracery. Only the North wall of the nave survives from the second half of the 14th century. There are two windows in this wall; that to the East has three lights with trefoiled openings in a square head. The 14th century window is similar to the side windows in the chancel. The South aisle was built in 1878. The porch, which is gabled to the North, has a 15th century arch to the doorway. In the East wall is a quatrefoiled window of the same date. The West tower was begun towards the end of the 14th century but not completed in the upper stage until the 15th century. It is of two stages outside, three storeys inside with angle and diagonal buttresses in two weathered stages and an embattled parapet. There is a two-light late 14th century window in the West wall, and the belfry has 14th century two-light windows. There are three bells, one of which is late medieval and inscribed "Ave Maria" in black letters. and one is by William Purdue 1615. The organ chamber was added in 1900 on the south side of the chancel. The Vicar at that time, the Reverend Joseph Cope, presented the organ, the choir stalls and the electric light installation. The pulpit and lectern were carved by Canon Gildea. There are two fonts, one of which is 12th century; it was found in the grounds of the Vicarage and replaced in the church in 1897. It is a plain cylindrical bowl with later mortices for staples; the original cover was probably padlocked to stop the Holy Water being stolen for use in black magic. In the children's corner in the South aisle there is a framed Nativity Scene made of fabrics by children of the village under the guidance of Miss E Muntz during the 1939-45 war. In the background can be seen the five Marys. The animals portrayed were known to the children, eg. Sammy, a chestnut horse, and Benny, a black and white collie. The gifts at the foot of the manger represent the gift each child felt he or she would like to give to the Christ child. The frame was made by the village carpenter from teak driftwood. The Parish Register commences in 1621. The last Vicar of St Nicholas was the Reverend Charles Richards; in 1917 Chaldon was united with Winfrith Newburgh. More recently, the parish was extended to include East and West Lulworth and the Rector lives in West Lulworth. 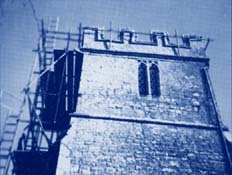 In 1996 a survey by an architect revealed that urgent repairs had become necessary to the roof, together with some renovation work on the tower, windows and masonry. The PCC intends to carry out this work, which is estimated to cost £40,000 and appeals for assistance in raising the money as such a sum is beyond local resources, even allowing for expected grants. We hope that you have enjoyed your visit to St Nicholas, Chaldon Herring, and that you will help us to keep our church to the glory of God and for the use of parishioners and our many visitors.